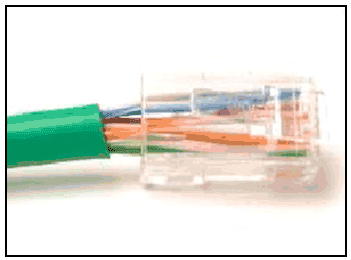 Which statement is correct about multimode fiber? The throughput of a FastEthernet network is 80 Mb/s. The traffic overhead for establishing sessions, acknowledgments, and encapsulation is 15 Mb/s for the same time period. What is the goodput for this network? What is the purpose of the FCS field in a frame? Which statement describes signaling at the physical layer? What is one main characteristic of the data link layer? Fill in the blank with a number. 10,000,000,000 b/s can also be written as (10) Gb/s. A network administrator is required to upgrade wireless access to end users in a building. To provide data rates up to 1.3 Gb/s and still be backward compatible with older devices, which wireless standard should be implemented? How is the magnetic field cancellation effect enhanced in UTP cables? The signals are sent on the media one at a time. 23. What is true concerning physical and logical topologies? 24. What is indicated by the term throughput? 25. Which characteristic describes crosstalk? 26. What technique is used with UTP cable to help protect against signal interference from crosstalk? 27. Which type of connector does a network interface card use? 29. Which method of data transfer allows information to be sent and received at the same time? 30. Which statement describes an extended star topology? 32. What is contained in the trailer of a data-link frame? 33. What is the function of the CRC value that is found in the FCS field of a frame?